Texting at the wheel and other collisions and the need for strict liability. Hope Fennell’s mother, Nazan in front of a truck like the one, which killed her daughter. of a queue of stationary traffic at a light controlled pedestrian crossing in King’s Heath Street in Birmingham,had been having an argument with his girl friend. This did not happen face to face, but took place when he sent and received 16 text messages from his mobile phone while he was driving through heavy traffic. As the lights turned green his 18 tonne, fully loaded, HGV moved forward. Hope Fennell, a 13 year-old schoolgirl, was still on the pedestrian crossing with her bike. She was on her way home from school and never stood a chance as she cycled across. It was said in court that Foster could not see her from his driving position in the cab as he moved off. The last of these 16 text messages was sent by Foster just 60 seconds before Hope was killed. As she lay dying in the road, Darren Foster got out, looked down at her body and bike under his lorry’s wheels and then climbed back into his cab. He sat down behind the wheel and deleted the text messages. In court, prosecuting counsel said police had compared his telephone billing history with recordings from his lorry’s tachograph. Police found he had travelled at speeds of 55mph while negotiating heavy traffic around Birmingham. They established he sent or read at least 11 text messages in the 20 minutes before the tragedy. Hope’s mother prepared a victim statement on the effect Hope’s death had had on her family, including Hope’s older brother and sister. The statement was to have been read out in court at the end of the trial. The defence did not object and gave permission but it was never heard. The reason? It was ruled by the judge that Foster was not to blame for Hope’s death because he couldn’t see her as she crossed in front of his truck. He claimed to have looked in all his mirrors as he moved off. No one could prove that, the only other witness was dead. Hope’s mother felt it was as if Hope was to blame. The judge said there was a blind spot in the lorry’s design. Did anyone ask in court if such a design of cab was safe to be on the road in a built up area? Did anyone ask why he did not take extra care because of this blind spot? In September 2013, Foster was jailed for 6 months for dangerous driving and for committing an act to pervert the course of justice. These convictions were not for killing Hope but for texting while driving and deleting the incriminating texts. He originally denied this, but then changed his plea to guilty when it became evident that he had no defence. By pleading guilty his sentence was reduced. The judge said he was blameless for the death of Hope because he couldn’t see her as he pulled away. He was told he would only serve 3 months in prison. In protest, after the trial, Hope’s mother sat down in the road where Foster had killed her youngest daughter and refused to move. She was on a memorial ride with many other local cyclists. The sit-down protest had not been planned but came about by chance. “A shop keeper came out of his store as we reached the spot where Hope died. He was an eye witness. He said he had been working that day, and saw a beautiful young girl lying in the road. He told me she looked at peace. That really affected me. I hadn’t heard that before,” said Hope’s mother, Nazan. So she went and stood in front of a lorry similar in size to the one which killed her daughter and then sat down in the middle of the road. She was joined by many other cyclists who were on the road with her. Police were called. Eventually after 30 minutes of traffic chaos, and with their point made, the cyclists moved off. The death of Hope Fennell is just one among many deaths of cyclists. They make news for a few months but then get forgotten by most, but not by those closest to the victim. were never able to complete their secondary schooling. Hope’s mother, Nazan, whose working life had been devoted to helping other people, found herself unable to go to work or leave her home. There are many parallels in the circumstances surrounding the deaths of Hope Fennell and the death of Daniel Squire on the A258 near Deal in east Kent, not least that both drivers admitted texting as they drove. Philip Sinden, the van driver whose van hit and killed Daniel, was acquitted of both dangerous and careless driving charges on 20 March, 2015. Tracy and Symon, Daniel’s parents were told by doctors that Daniel would probably not survive. As the Kent Messenger reported, “They made the heart breaking choice that if he were not to survive they would like to know his organs had helped someone else.” His father said he was very fit and his heart would have been in good condition. From the age of 8 he was a keen member of Deal Tri and was thrilled to be accepted for the Ironman contest in Bolton. He was riding his new bike that Saturday 7 September, 2013 to meet up with his father and other club members in Deal. He never arrived. When the jury delivered their not guilty verdicts at Canterbury Crown Court, members of the public in the public gallery shouted to members of the jury, “Were you not listening?” The judge, addressing Daniel’s uncomprehending family, said, “I understand that is not the result you were expecting.” Daniel’s mother, Tracy Squire, broke down in tears. She had to be helped from the court. On Thursday morning 9 April, 2015, Moira Gemmill was cycling from her home in Kennington to her work at St James’s Palace, when she was hit by a lorry at the Milbank roundabout off Lambeth Bridge. Moira Gemmill was a leading figure in the world of art and design. She had been head of design and exhibitions at the Museum of London and until the beginning of 2015 had been director of design at the V&A. During her time visitor numbers had risen from 900,000 to 2,900,000. While at the V&A she was personally chosen by the Queen to oversee major modernisation programmes at Windsor Castle and the Palace of Holyrood in Edinburgh. She had just started that job. Now like Hope and Daniel she is yet another road traffic statistic. Most cyclists killed by heavy trucks. Many of these trucks in London are going to and from a construction site and are on a strict time limit for their journey. Does this encourage reckless behavior on the part of some drivers as they try to avoid a penalty? The latest Construction (Design and Management) Regulations 2015, which came into force on 6 April, 2015 are very strict about vehicle movements inside site boundaries (Regs 27 & 28). This makes the vehicle “a place of work” and the driver then owes a “duty of care” to everyone on the site. Not just operatives but visitors and members of the public. However once a vehicle leaves a site these rules no longer apply, even if the vehicle is transporting materials from one site to another. If these deaths were occurring on site then the HSE would act. Because they happen on the road they somehow fall through the cracks between legislation. Defence barristers will say their client couldn’t see the cyclist or pedestrian, and will claim the vehicle had a blind spot. No one appears to have the power to change this, but strict liability would certainly concentrate minds. 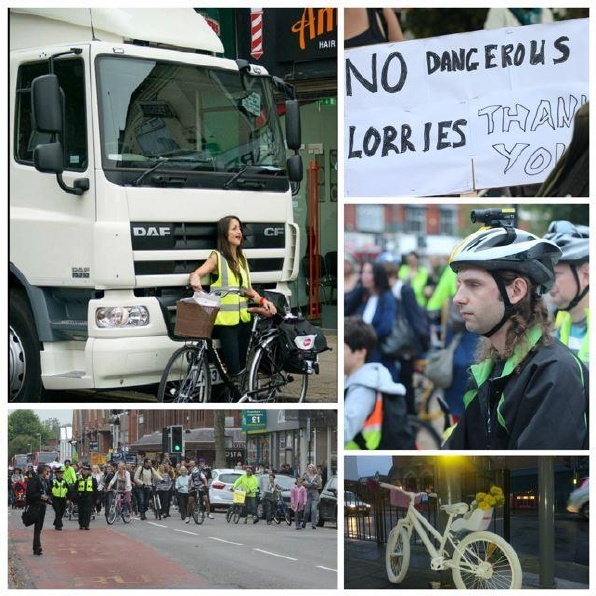 In many EU cities and towns heavy lorries are banned at certain times, and especially in the rush hour when people are going to work or school. From research carried out by the CTC, the chances of any vehicle driver being prosecuted for causing death by dangerous driving or the lesser charge of careless driving is 1 in 10. In only two recent cases, heard at Canterbury Crown Court, have motorists been found guilty in dangerous driving cases or careless driving cases in which a cyclist was killed. In each case this was because the driver pleaded guilty. The CPS do not charge drivers unless they feel the evidence points 100% towards a conviction. So why arethe chances of a conviction so slim? Is it because most juries consist of drivers who identify with the accused? Do juries tend to believe the urban myths that cyclists ride on pavements and then off them without warning, never give hand signals, don't have bells and jump red lights? One of the first questions asked after a cyclist's death is, "was the cyclist wearing a helmet?" It's as if not wearing one somehow denotes contributory negligence. This is the exact opposite of what happens in most European countries where the first thing that would have been asked is, "Were there any actions on the part of the vehicle driver which caused the death of the cyclist? Why did the driver not see the cyclist?" All drivers are expected to anticipate what could happen on the road ahead of them. That’s one of the reasons drivers are expected to allow adequate braking distance for the speed they are driving. Questions on braking distance form part of the driving test. So why are drivers not expected to apply this care to cyclists? After all, the collision which killed Moira Gemmill occurred in broad daylight, in good weather and visibility. As did the collision which killed Daniel Squire. Peter Murray outside City Hall London with a Strict Liability sign. Peter had worked with Moira Gemmill. In 2012, Peter, (Hon FRIBA, and Chair of New London Architecture) launched Building Design magazine’s campaign for safer cycling with Richard Rogers. Strict liability is part of civil law. It enables the victim of a collision, who is often badly injured, to claim damages quickly. Often it takes badly injured victims years to get compensation and this can be eaten away by legal fees. If any of these drivers, who have killed or injured a cyclist or pedestrian, had driven into a car or any other vehicle, it would nearly always have been held to have been the driver's fault by their insurance company for not allowing sufficient braking distance whether they saw the car or not. The driver’s insurance company would automatically pay up. The driver would get an increased premium. This is a form of "strict liability" and has no doubt been accepted as a “gentleman’s agreement” to save endless costly legal arguments between the insurers. It makes drivers careful. We have accepted that the wearing of seat belts is compulsory so why not strict liability on all collisions? The UK, Ireland, Cyprus, Malta and Romania are the only countries not to have adopted this simple approach of strict liability. In the EU, "strict liability" forms part of insurance policies. The heavier, more powerful vehicle, has to prove they did nothing wrong. In the UK it's the dead cyclist or pedestrian who is often the only witness. They are the victim where the usual excuse is, "Sorry mate I didn't see you". In Denmark if a schoolchild is killed on the road then all the papers on that case go to the Minister of Transport. That does really make drivers careful. Every time a driver gets into a car in the UK they put on their seat belts, as do passengers including those in the back seats. Otherwise they are not insured. There are strict rules for carrying children in cars including warning notices about airbags and children. Nowadays such behaviour is accepted as normal. It wasn’t always the case. Too many innocent lives are being lost because of an attitude, which exists right throughout our society. It is the perceived that the motorist has the automatic right to be on the road to the exclusion of all others. Often the argument that is used to support this is that only motorists pay road tax. That is false logic. There is no such thing as a road tax. The cost of roads is paid for out of general taxation. Most cyclists own cars. Any cyclist belonging to the CTC automatically carries third party insurance. Fifty years ago there were no drink drive laws. There were no seat belt laws either. There was considerable hostility at first to seat belts, just as there has been to speed cameras, but airbags seem to have been accepted without question. Is it because they are invisible until needed? The first result of the drink drive and seat belt laws introduced in 1965 was a dramatic drop in road deaths and serious injuries. Many have argued that the adoption of strict liability would produce similar results. After all that is what happened in all the EU countries which adopted it. During the 12 years to 2011, the police recorded more than three million road casualties in Great Britain. More than 36,000 people lost their lives and another 373,985 were seriously injured. But the police figures do not reflect the full scale of death and injury on the roads as many incidents go unreported. The best official estimate of the total number of people killed and injured in road collisions each year is a massive 730,000. While the price paid by the victims and their familes is inestimable, the annual cost to the economy is between £15bn and £32bn. For governments hell bent on showing they could reduce debt, this seems far too easy a trick to miss. The first thing that would happen if strict liability was introduced would be that casualty figures and deaths would fall immediately, just as they did after seat belts and rink driving became a legal requirement in 1965. After all that’s what happened in the EU when it was introduced. The second would be that the big insurance companies would press for safer roads for cyclists. It would save them money. They would want the UK to adopt the best design principles for black spots like the Lambeth Bridge roundabout where Moira Gemmill was killed. It wouldn’t cost any government much to introduce strict liability, to make our roads safer for all, just the cost of writing it into legislation. It would produce vast savings, not just in lives, personal injury and wrecked families but it would save a huge amount of money, which is something dear to most politician’s hearts. Just think of the cost of this daily carnage to the cash strapped NHS, police and Fire & Rescue Services.